Cryogenic Ltd manufactures a wide range of superconducting magnets for research and industrial purposes. A range of standard solenoids between 1 to 22 Tesla is produced, and in addition split pair solenoids in the range 1 to 14 Tesla, with a typical central field homogeneity of 0.1%. The bore diameters range between 40mm to 300mm clear bore, depending on the magnetic field. All Cryogenic magnets are supplied as training free and will have been tested at 4.2K, 2.2K or both depending on specification and will have quenched at above their guaranteed field. A full test report will be provided and computed magnetic field profiles are available for positions on and off the central axis. 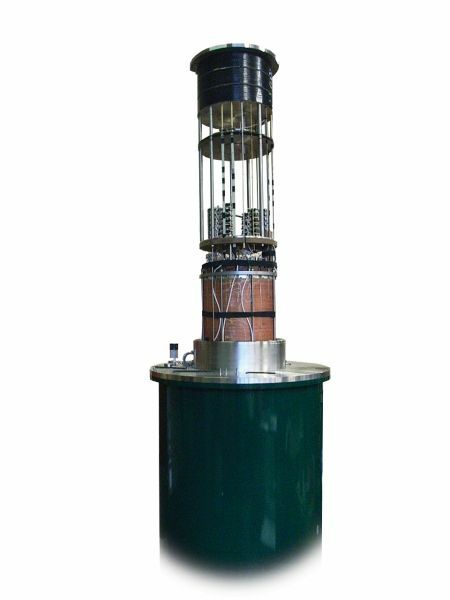 Cryogenic have unique experience in being able to offer magnetic fields in excess of 22 Tesla in a wholly superconducting magnet. This is an exclusive product based on the combination of Cryogenic's long experience fabricating high field superconducting solenoids together with the HTS materials technology available for practical applications. The general design of the magnet follows the conventional approach of using NbTi conductor to provide a backing field of some 11T @ 2.2K, and then utilising the higher current densities available from advanced Nb3Sn conductor to generate a combined central field in excess of 20T. The final 2T central field is then realised from a HTS superconducting coil insert which offers high current densities at the highest fields at liquid helium temperatures. The complete magnet generates 22T in a central 30mm bore. The main 20T conventional coil is wound from multifilamentary superconductor in multiple sections, the outers being of copper stabilised filamentary niobium titanium, and the inners of filamentary (doped) niobium tin conductor. The coils are vacuum impregnated with epoxy resin to form a composite structure of excellent mechanical strength and electrical insulation. A superconducting switch (optional) is connected across all sections to enable operation in the superconducting persistent mode.